Preheat oven to 400 degrees F (200 degrees C). Line a baking sheet with parchment paper or aluminum foil. Place eggplant, cut-side up, on the prepared baking sheet. Sprinkle garlic over each and coat with olive oil; season with salt and pepper. 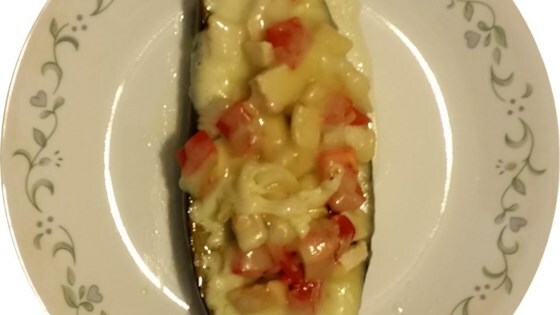 Bake in the preheated oven until eggplant is mostly tender, 25 to 30 minutes. Add chicken, tomatoes, and Cheddar-Monterey Jack cheese to each eggplant. Continue cooking in the oven until cheese is melted, about 10 minutes. Top each with scallions and basil. Cheddar cheese can replace the Cheddar-Monterey Jack cheese, if desired. Very bland I would make it lemonier, spicier or make it into a dessert with brown sugar/cinnimon. Delish, can't wait to make it again. Very good. Eggplant was a little mushy, but excellent flavor.